Ensure You Meet Essential Oil Storage Regulations. Under The Control of Pollution Regulations and the Environment Agency guidelines, anyone in England storing more than 200 litres of oil is required to offer safe containment provisions for drums, Intermediate Bulk Containers (IBCs), mobile bowsers and tanks. Statistics have found that over a sixth of all pollution-related occurrences impacting the environment are due to oil, with the majority of incidents arising as a result of leaked oil from tanks or pipework, over-filled tanks or even vandalism. These Regulations aim to prevent the likelihood of these incidents by requesting tank owners to offer an additional housing solution (such as a drip tray or bund) to stop oil from escaping into its surrounding areas. The standards state that containment facilities such as drums and tanks must be durable enough to retain the oil without the risk of leakages. Secondary containment units, such as that of a bund or drip tray, should be designed to catch any leakages from either the container or its supplementary equipment and pipework. In addition, the secondary storage container must comprise at least 110% of the contents of an Intermediate Bulk Container (IBC), mobile bowser or oil tank. Should extra containers be held in storage, then the secondary storage units must have enough capacity to house 110% of the contents of the largest tank; or alternatively, 25% of the entire storage volume (depending which is greater). Other necessary criterion the additional containment unit should meet is its rigid construction – with its base and walls designed to withstand any water and oil from permeating the container. Failure to comply with the Regulations will immediately result in an offence as well as the possibility of being hit with a £5000 levy. Containerised storage is one of our most exhaustive ranges, and can range in size from small parts bins and everyday plastic boxes through to bulk storage tanks which can be used to store foodstuffs, inks, coatings or chemicals. Obviously the objects or materials that you need to store will determine which storage product is right for the job - but it’s often just as important to consider how and where the product will be used. The material that the product is made from is one of the main considerations. For products that will be kept outside, galvanised steel is both strong and weather-resistant. There are also lots of plastic products made from recycled materials through to food grade polypropylene that can withstand hot and cold environments. Plastic is also easy to clean and is resistant to oil and moisture. A further consideration to determine which product is best suited to your needs is how the containers will be used, do you need a set of shelves or cupboards to store them in, or will they be used as distribution containers, in which case you may need to look at foldable crates which can save space on return transport and be stored easily when not in use. Storage cages can add another level of security and are ideal for chemicals, gas cylinders or archive boxes containing sensitive information. However, if security is your prime concern it’s possible to buy secure versions of nearly all storage products including secure transit cases, locking bulk storage containers and cupboards to store tools and other valuable items. Take a look at the following product highlights, which illustrate the main differences between the types of storage containers on offer. It might help you to make a decision as to which product would be most appropriate for your needs. Containers / Archive Storage - A range of containers and boxes in different shapes and sizes to cater for your needs. Many can be used with hanging files and so are suitable for filing and archiving. Attached Lid Containers - Ideal for extra security as the lids can be sealed and the contents are protected from dust and moisture. They are available in different colours for colour coding purposes and also can be used with dollies to enable them to be moved easily. Industrial Folding Boxes - Foldable and stackable containers are specific to certain applications and industry sectors. Many are available for food industry use and they often collapse for economical transportation and storage. Tote Pans - An economical system for storing components. Supplied with handles at both end for easy lifting. The galvanised versions are suitable for storage of heated parts. Available in various sizes. Ideal for the storage and organisation of small parts. Available in freestanding units, wall mounted kits or sold individually. 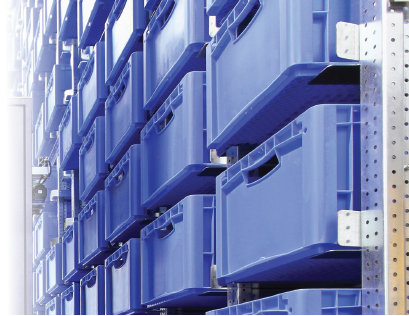 Palletised Storage Boxes - Used for securing palletised loads, ideal for use within the retail and food industries. They enable pallets to be stacked when full, so maximising space. Many fold down for easy storage and return transport. Bulk Storage - Tanks, large bins and lntermediate Bulk Containers (IBC’s) are suitable for a range of items, including food ingredients or chemicals depending upon the material. Liquid Storage Containers And Jerricans - Containers suitable to store liquids of any type including hazardous chemicals, some are made of a food grade polyethylene. Pails and Drums - A range of lidded containers suitable for storing chemicals, paint or food stuffs depending upon the material. A range of lidded containers suitable for storing chemicals, paint or food stuffs depending upon the material. Outdoor Storage - Storage cages and lockable cupboards suitable for storing chemicals or valuable items outdoors.